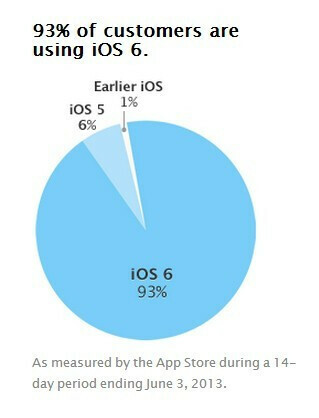 Apple is now doing a similar pie chart-y thingy, but it's as if to say "there's nothing to report here," as 93% of its iDevice users are updated with the newest iOS 6, and a very minor fraction is still running older versions of its mobile OS. "Fragmentation? What fragmentation?" might have been the working title of the chart you see on the right, which is posted at the iOS Developer Center to orient devs about the most popular version at the moment. There is a technical reason for some of these... for ex: Airdrop requires wifi with dual radios 2.4ghz and 5ghz, so that's why it is not available on older HW. Regardless, it is safe to say Apple does a better job an maintaining their HW than any Android OEM, other than Google itself; so they have a point. look at nexus 4, 7, 10. they all are update on the morning of days the new update is released straight from google. touchwiz, sense and all the other arent responsibility of google. its like i made my own version of android and blame google for not updating it. Facetime over 3G? works on the 4S and 5 that I have tested, not sure of the 4 since is already 3 years old, so not much to say there. You can get an app for that.The iPhones can do almost everything because of it's App Store. Talk about polishing a turd Having the version number without the features is fragmentation. Plain and simple. Same as on android. You have different version numbers and you have different features. I'm on iOS 6 on my iPod Touch 4 and missing many features. When iOS 7 comes out fragmentation will be worse as many device won't be able to update. Also only the latest devices get features such as AirDrop (wifi transfer) and camera filters. You're missing the point... The chart is meant for developers, which essentially says "it's okay to go on and use the latest SDK without worrying too much about old versions." Not exactly the same story for Android devs. so youre saying you rather not get the update at all over getting the update with a few features left off? it has never happened to me on android but if spent even 5 mins to check for update and download and install it and didnt see any difference i would be pissed off. google went from 4.2.1 to 4.2.2 and no one could see the difference but there was one and specially one i was struggling with. it fixed the bluetooth headphones sound quality. Apple marketing invented fragmentation. It only makes sense that they would be able to make the rules about what does and doesn't count as fragmentation. Clearly, this is similar to the game, "I win." considering that there is only one manufacturer. this is some feat. seriously, if the chart looked anything other than this, it would spell a total failure on apple. unable to keep a few phones up to date. google is building an OS for phones that they don't make and the variations are legion. apple is lame for this. no one cares. go figure out how to make your os un-boring. Those of us who are still running iOS 5.1. Perfecet example of how making assumptions makes you look like... Well, you know the rest. No, I'm taking about an $800 iPad which still works, although it's slow, laggy, and force closes a LOT! Why upgrade to get the exact same device with a slight hardware bump. I shouldn't need a camera to edit movies. iOS is fragmented and that's that. As for cheapskate, I paid over $800. You sit down, and find something to remove that foot from your mouth. LOL. I already had a laptop genius, and I had the money for an iPad. First you say there is an app that can do that, then you say the hardware is the reason I can't do it. Which is it? I just saying, iOS is fragmented as well, so they should stop acting as if they're perfect. Apple is deliberately lying, because even if every single iOS user upgraded to iOS6, some features are available only on some iphone/ipad versions. For example, iPhone 4 users don't have Siri. 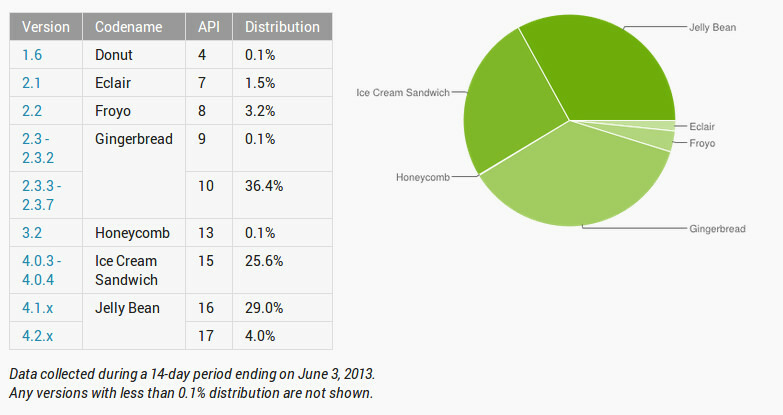 So iOS is fragmented as well. Just, fragmentation is not in the version but in the features that are enabled or disabled according to the model. Apple, please, try again... you're not even a good troll. If you own a 3GS or older iPhone YOU DESERVE to be fragmented. Get with current technology people. 3GS!! Apple wouldn't even care about iPhone 5 once iPhone 5s hit the shelve. Lol!! Please put back the dislike button! I'm enjoying Google now on my iPhone 3gs, you call that fragmentation?